Home > About Us > Pre-Order the 27th Volume of the AAPR Today! Pre-Order the 27th Volume of the AAPR Today! The Asian American Policy Review is proud to announce the release of the journal’s 27th volume, featuring contributions from researchers, practitioners, artists and activists throughout the country. 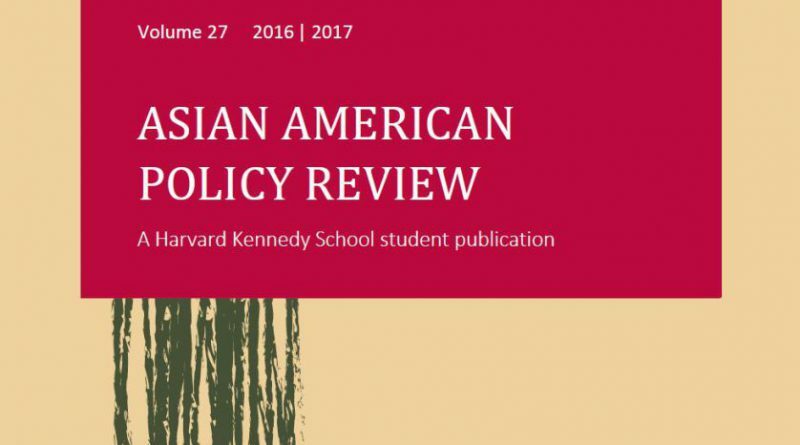 Click here to order a copy of the 27th volume of the Asian American Policy Review. This year’s journal asks what it means for the Asian American community to become authentically Asian American, especially in this polarized and challenging political climate. The Asian American label, which was birthed out of the spirited political activism of the 1960s and 70s, has become more salient for our community in recent months. As author and activist Jeff Change notes: “There was a time when the term ‘Asian American’ was not merely a demographic category, but a fight you were picking with the world.” We explore the complexity and potential of the Asian American political identity in this volume through Paul Ong, Chhandara Pech, and Alycia Cheng’s research on Wealth Heterogeneity Among Asian American Elderly, Kartik Naram’s piece on Racial Capitalism, Gentrification, and the Identity of Chinatown, and in an adapted version of the National CAPACD and CNHA #OurNeighborhoods Report on Anti-Displacement Strategies. The formation of Asian American identity—with the added complexity of intersectionalities and multiracialism—remains difficult to capture because of the heterogeneity of the Asian American experience. We are not all alike, and this volume speaks to some of these challenges with Elizabeth Lin’s piece on The Loneliness of the Progressive Asian American Christian, Ivan Rahman’s commentary on Three Things Asian Americans Don’t Want to Talk About, and through the creative work of uyên phương hoàng (“When Hate Came”), Kimberly Zin (“Hyphens”), and Shurooq Al Jewari (“Islam”). We also recognize that we are in a constant process of coming into our identity as Asian Americans, and we include three discussions examining the nature and role of AAPI political participation. The first, by Ga Young Chung, examines the role of DACA in mobilizing political action by undocumented Korean Americans who are At the Crossroads of Change. The second, by Managing Editor Claris Chang, analyzes Asian American Lobbying, with a brief excerpt by Elena Ong on The Future of Asian American and Pacific Islander Political Power. Finally, we present An Interview with Dr. Elisa Choi, a Commissioner on the Asian American Commission of the Commonwealth of Massachusetts. As I note in the Foreword, the Asian American community–and by extension, the Asian American Policy Review–is in a constant process of becoming more authentic to ourselves and to the legacy of activism upon which the Asian American label and the founding of this journal are rooted. We look forward to having you join us on that journey. Daniel Minyong Cheung is the Editor in Chief of the Asian American Policy Review. He is in his fourth year of the concurrent JD/MPA program at Harvard Kennedy School and NYU Law School. He specializes in environmental and land use law and policy. Upon graduating, Daniel hopes to practice law in Salt Lake City, where his partner is completing a PhD.